Today marks the debut of The Memory Nest Design Team. I am so excited to be part of this group of talented and creative ladies - these girls have created some truly incredible layouts which you can check out here. This week we were asked to create a layout using the True Love paper line from Basic Grey. It is a beautiful line mixing fun and whimsical patterns with some that have a more vintage vibe. 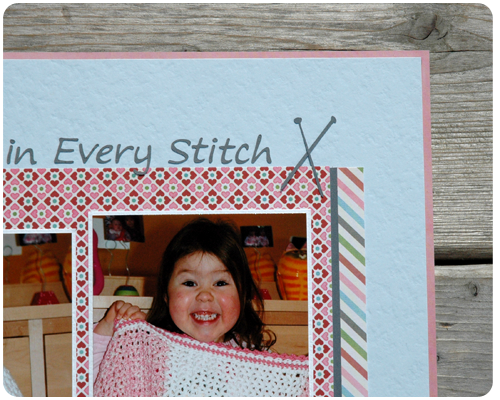 As soon as I saw this paper, I knew that it would be perfect for the pictures I have of my daughter with the pink and white blanket that I crocheted for her. I titled my page "Love in Every Stitch" to keep the whole "handmade/stitch" theme going. I also cut out some knitting/crochet needles using my Silhouette - the perfect embellishment for this page. Of course I added some flowers..a staple for any layout of my girl. The centers of the flowers are buttons from the True Love line; I love how some of the buttons in this line are in the shape of flowers (shown in the second picture below). This is a beautiful line of paper and I really enjoyed working with it. Please check out the work of the other design team members and be ready to be inspired. Aww, this is just beautiful! I saw you featured at Violet Imperfection and came to take a look. This is just precious, and a great way to preserve the memory of her using the blanket too! Thank you for coming by to have a look around. The way my daughter reacted to me making this blanket for her was so precious; I absolutely had to document it. Thanks for following along Jenn.